Hello readers. I hope you are well. 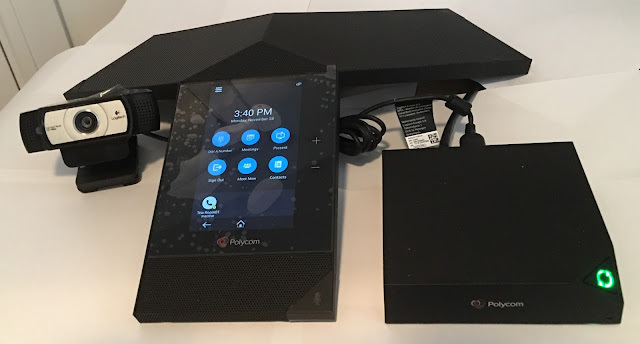 I recently got my hands on a Polycom RealPresence Trio 8800 Collaboration Solution including the Trio conference speakerphone, the Visual+ Smart Hub and the Logitech C930e. This happened to coincide with the release of an updated firmware release with the new Skype for Business UI. I thought I would share my experience with you. As you know, I am always looking to try out anything and everything in the Skype for Business ecosystem. I have been fortunate enough to get to try hardware and software solutions from several vendors. I've tried out headsets, IP desk phones, load balancers, SBC's and reporting tools. The one category that has so fare eluded me is meeting room peripherals. To clarify, I have used meeting room solutions before, but really only for joining an existing meeting or starting an ad-hoc one. I haven't had the chance to set them up or do thorough testing, until now. Meeting Rooms come in all shapes and sizes. The size of a meeting room defines the intended use, but not the equipment. The intended use of the room should define the equipment. A small room can be used for anything from a quiet space for one person to work to a place to have an audiovisual meeting with someone in another location. The equipment used for a small room can vary from nothing, where the user will bring personal audiovisual equipment, to a desk phone with or without video. Generally speaking, the user would bring a laptop for the collaboration experience. A large auditorium style room is generally used for one or more presenters to share information with a large, seated audience and sometimes broadcasted or recorded for remote or offline viewing. The equipment for large meeting spaces can also vary, but usually involves some kind of audio component with microphones and speakers to amplify the speakers' voice to the audience, a screen to show content and possibly video equipment. The medium sized space has the most possibilities for usage and therefore the equipment that is used. Not sure if you've seen this often used slide. This Microsoft slide defines 6 meeting space types. On the Go and My Stage are small meeting spaces. Auditorium is, of course, the large meeting space. The other three are medium sized spaces. The most common of which is the Conference Room. It should be easy...but it isn't! Most companies have at least one conference room in their building. The conference room is one of the easiest rooms to define and one of the easiest to mess up. The standard equipment for a meeting room is usually a large table, a number of chairs and often there is a whiteboard or flip chart. If you stop there, there isn't much to go wrong apart from the temperature. It is usually the technology that lets it down. How many times have you been in a conference room and the host struggled with the technology? If there is a screen, the first hurdle is that there are four common connection types to choose from. This mess of cables poking up through a hole in the table then defines where the presenter can sit. It is then up to the presenter to have one of the available ports on their laptop or (more often) tablet. If the presenter has a hybrid device like a Surface, they must also have one or more adapters to take in HDMI, VGA or DVI and convert to the the on-board mini display port. If there is an audio device it is usually, in my experience, a so called "Star Phone". This could be generic analog, PBX vendor proprietary digital or SIP based. More often than not, they are Polycom. The audio experience is usually one of dialing in one or more participants and conferencing them together. If you're lucky, it might be a single call to a conference bridge number. If there is video, it could be anything from a USB webcam to a video "codec" and static or PTZ camera. If it is the latter it may or may not be connected to the audio source and it usually comes with a huge remote control. If you're lucky, the meeting for that room is in the calendar for the device and joining should be fairly straightforward. If not, joining will be a combination of typing out a long string to join a meeting room or the IP of someone remote or all of the above. It is an all too common experience that people are left fumbling for 10-15 minutes and the meeting starts late, if it works. If it doesn't, there will be a call to IT to help sort it all out. Or worse still, the presentation is emailed to the remote participants to look at independently and the presenter simply describes the slide deck using audio only. We've all been there! If you're one of the millions choosing to move away from disparate systems to a unified experience using Skype for Business, that's a good start. Skype for Business is a platform for exceptional communications. It is possible to improve upon the above experience with nothing more than a laptop and a Skype for Business account. That only gets you so far. You still need endpoints and peripherals to take it to the next level. What you need is Skype for Business for your meeting room. One thing that is great about Skype for Business, and Lync before it, is that you aren't limited by the devices the vendor has chosen to manufacture. With so many PBX vendors you can only use devices from the vendor price list. First party devices usually work better than those from other vendors, right? I won't make any comments about other PBX vendors solutions', there are too many to name and I can't keep up with what they're all doing. Generally speaking, if you have a conference phone, it is SIP enabled and will register as a device to the PBX. Once registered, it is for all intents and purposes, just a phone. To start a conference call, you dial a bridge or a group of users. Microsoft can do this too. A generic analog or SIP conference phone can simply plug in or register to an SBC or gateway connected to Skype for Business. Microsoft has enabled an ecosystem of partner solutions that are compatible and qualified to work with Skype for Business. Qualification is a process vendors go through with a Microsoft program called the Unified Communications Open Interoperability Program (UCOIP for short). The vendor submits some phones with specific firmware to Microsoft for testing and Microsoft either grants it or doesn't. The next step up is a conference phone which is optimized for Skype for Business. These are the devices which run Lync Phone Edition. You remember Lync Phone Edition. This was the program where Microsoft wrote a Lync client designed to run on phone hardware. They gave the spec to three vendors, Polycom, Aastra (now Mitel) and HP and said, build this phone and you can run this software. Polycom had a few devices which ran Lync Phone Edition (LPE). The desk phones are the CX500 and CX600, the conference phone is the CX3000. These devices could log in as a user or a resource account as a common area phone or meeting room. The advantages were directory integration, presence and ease of use. Since this post is about meeting rooms, I'll focus on the CX3000. Essentially, you could schedule a meeting as a user and invite the room account assigned to the CX3000. When it was time to start the meeting, the user just needed to go to the calendar and press join to start the audio conference. This is great, but what about video and content? Also, Lync Phone Edition is end of mainstream support in April 2018. About 16 months from now. The so called Round Table devices from Polycom come in two flavors now. The CX5100 is a USB device with a built in speakerphone and panoramic camera. These are designed to run connected to a laptop with the Skype for Business client running. The CX5500, by comparison, is also a SIP endpoint which runs the Polycom UCS operating system like the VVX range of phones. It can run just like the CX5100, simply as a USB endpoint, or sign in with a resource account like the CX3000. Audio and video is taken care of with the round table devices. If you want to present content, you still need to plug into a screen. So you'll also need a laptop to plug into the screen and share the content. If the CX5500 joins the meeting as a meeting room, you'll also need to drag the room into the meeting. I'm only grouping these together because they are similar. To massively simplify these, they are dual stack audio/video endpoints with collaboration capability. They are standards based SIP devices that can register to the Polycom RealPresence platform of bridges etc or as a meeting room in Skype for Business. The experience you get is very much dependent on how it is all configured and what you have at the back end. If you only use Skype for Business, the content is driven by the SfB client, while audio and video is driven by the codecs. If you use a combination of Skype for Business and Polycom, you get more options for sharing and meeting control. Polycom has been a clear leader in this space for some time. I go to a lot of meetings and see a lot of meeting rooms. Ninety-nine out of a hundred of them have a Polycom conference phone. That said, there are additional options from several vendors like Logitech, Yealink and StarLeaf. When I get my hands on any of these, I'll be sure to give them some air time. The point is there are many choices thanks, in part, to the UCOIP. Competition, after all, is the driving force behind innovation. One point I want to make before I move on is that there is really no one size fits all device for every situation. You really need to define how you intend to use a space BEFORE you commit and purchase devices. I would also say that you shouldn't stop with the typical usage. What I mean is don't just buy a webcam, a TV or projector and a conference phone because you want to use audio, video and present something from a laptop. Think about the platform you are using to stitch this together and think about what is possible, either now or in the known future. Planning for the future is surely the best way to get the most life out of a device and the most return out of your investment. Excuse the photo please. I left the protective wrapping on because it is a loan device. The Polycom RealPresence Trio is, in essence, a new Skype for Business compatible conference room phone. Unlike the CX3000 which runs LPE, the Trio runs the Polycom UCS operating system, similar to the CX5500 and the VVX range of desk phones. The device can register directly to Skype for Business with a meeting room account. Since the meeting room account is also mail enabled, it is possible to invite the Trio as a Room resource. For ad-hoc meetings, the Trio can simply be dragged into an existing call or a new meeting can be started directly from the unit itself. The device has a nice, responsive, capacitive touch screen and familiar controls for performing common tasks. If you have Skype for Business, and a meeting room, you need a conference phone. Setting up the Trio is fairly simple. First things first, you'll need a Power over Ethernet Switch or power injectors to use it. You'll also need an appropriate administrative account in Active Directory, Exchange Server and Skype for Business. Next you need to set the calendar processing to automatically accept the meetings. Next you need to set the mailbox mailtip to inform anyone that invites the account to a meeting of the possibilities. 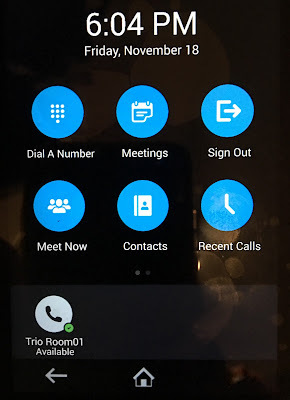 Set-Mailbox -Identity Trio.Room01@lyncdomain.com -MailTip "This room is equipped with a Polycom RealPresence Trio 8800, please make it a Skype for Business Meeting to take advantage of the enhanced meeting experience." Now switch to your domain controller and open PowerShell as Administrator. Run the following to set an account password and to enable the account in Active Directory. After you run this command you'll be prompted to enter the current password. Since there isn't a current password, just hit enter. Then enter the desired password, press enter and then enter it again to confirm. Now switch to a Skype for Business Front End server and open up the Skype for Business Server Management Shell as Administrator. Run the following to enable the account/mailbox as a meeting room in Skype for Business. Update: Pat Richard, an Office Servers and Services (Skype for Business) MVP, PowerShell scripter, blogger, author and all around nice guy has a script that should take care of all of the account stuff for adding a room system. He says he hasn't played with the Trio yet. It was originally written for LRS and updated for Skype Room System. Now you'll want to set the base profile of the unit to Lync. Use the Web UI. You can get the IP address of the device by tapping on the menu button in the top left of the screen. This will expand down and show the device IP address. Browse to the IP address in the browser. I had to use https and create an exception about the un-trusted certificate. Once you are presented with a login page, tick the admin radio button and enter the admin pin which is 456 by default. Go to simple setup and expand base profile and change it from Generic to Lync and press save. The phone will reboot which takes a good few minutes. Once the device reboots you can use the account you created to sign into the device. I used the touch screen to enter the account details and password. Simply click sign in and enter the details. I used mine against a Skype for Business Server installation where I am remote to the setup. Once the device signs in it should look like this. You'll now want to upgrade the firmware to the latest version. I used the Web UI. Go to Utilities and Software Upgrade. Now click Check for Updates. Use the drop down list next to available software versions and choose 5.4.4.7511. This is the new Skype for Business UI. Now click install. Seemingly nothing happens. The only indication that anything was happening is that I got a spinning gear in the top right corner of the device. The update took around 20 minutes and without warning, the device rebooted. Once the phone boots, the screen changes to the new UI. You get the familiar, blue circles and the icons are similar to the icons in the SfB client. The capacitive touch screen is a joy to use. A swipe takes you to the next screen with the call history, Bluetooth and settings buttons. The first thing you will want to do is to enable the web UI since this is off by default. To enable the web UI, Swipe to the second screen -> tap settings -> advanced -> enter the admin pin and tap done -> administrative settings -> scroll down to web server configuration -> enable Web Server and choose your Web config mode. I'm happy with https only, so I chose that option. Now simply click on the home button and the setting is live. Now you can browse to the Web UI. If you also have the Visual+ accessory and Logitech C930e, these devices need to be paired with the Trio. For my set up, I plugged the network cable from my PoE switch into the Trio, and a second network cable from the Trio into the Visual+. The Logitech C930e device simply plugs into one of the USB ports on the back of the Visual+. To pair the Visual+, go to settings -> Advanced -> enter the admin pin and tap done -> tap networked devices -> you should see an available device, in my case FCA5DD, tap on it to begin the pairing process. Again, no real indication that anything was happening other than the spinning gear. Once the pairing process was complete, the presence indicator went from flashing red to green. For starters, it is a Skype for Business conference phone, and a really good one at that. I'll start by saying that the audio quality is outstanding. I can't say I'm testing it fairly in my tiny home office, perched on the box it came in, but it worked nonetheless. I could hear the far end speaker clearly. The far end said that they could hear me clearly too. The Trio has something called NoiseBlock which is supposed to recognize between human speech and other noise and block out the unwanted noise. I tested this by shuffling papers and the far end couldn't hear it. The mic is supposed to be able to pick up speech from 20 feet away. This should accommodate large meeting rooms. It also has two ports for remote mic's if needed. The Trio is signed in to Skype for Business which means that it should have access to the internal directory. To search for a contact, just tap contacts and enter something in the search box with the on screen keyboard. It should now search the corporate directory by default. The previous firmware gave you a choice of local or corporate. When you find a contact, tap add to contacts to add the contact to the local contacts. To add an external contact, tap the menu key in the bottom right (looks like three horizontal lines) and tap add, enter the full SIP address and then tap submit to add the contact to the directory. To place a call, select a contact and tap dial on the bottom left. To add someone to the call, tap add, select the contact and tap dial. This creates a conference call. You can also start a meeting with a single click by tapping Meet Now. Then you add your participants one at a time. Scheduled meetings show up in the Calendar and display a toast with a join button when the reminder notification is set to display. All really intuitive. The Visual+ is a Smart Hub which connects the Trio phone and the Logitech C930e and makes it a full meeting room system. Plug the Visual+ into a screen or projector using an HDMI cable and you get a default hub screen with a nice, changable backdrop and the self view of the webcam. Me, taking a photo of the screen. When you start a multi-party call or meeting, you get a nice video layout. Me, taking a photo of the screen... again. And that is the Death Star over my shoulder. You can share your screen from Skype for Business on the hub display. You can't share a PowerPoint directly into the Skype Meeting, well you can, but it won't show on the hub. Just present your screen and then open and run the PowerPoint deck and it will show on the hub and to remote SfB participants. You can also share content using one of a couple of Polycom apps which you install on your laptop or smartphone. This is either RealPresence Desktop or Mobile or the People+Content IP desktop application. It would be really nice if you could attach a file to the meeting invite and then present the content from the phone display. But I guess that will be the domain of the Rigel stuff. Even presenting from a local USB key would be an improvement. It is also Bluetooth enabled with NFC, so it can be paired with your smartphone and used as a speakerphone or for music playback. If you have and are licensed for RealPresence Mobile, you can use the Bluetooth pairing to share content. You can share content from local documents, photos, a website, or Dropbox. You can also choose to share annotations you make on the Whiteboard or Blackboard application within RealPresence Mobile. The People+Content IP application is an application that simply mirrors your desktop screen to the Smart Hub. For guests that want to share content, you can get them to install the People+Content IP app which is, fortunately, free. However, good luck if your guest doesn't have local admin rights on the laptop. If you connect the laptop to the Visual+ via USB, however, a folder with the People+Content IP application should open automatically. This is an executable version of the app. To share content only (no video) simply open the content you want to share, run the app and click the big play button. If you install the application, you can connect to the Trio remotely by entering in the IP address. This, of course, means that your guest needs to be able to see the IP of the Trio. So it is better for guests to use the executable app using the supplied USB cable. However, if your laptop is on the same network, you can use the app remotely to present your screen to the Smart Hub. Yes it is. The Trio as a conference phone is excellent. A worthy successor to the CX3000. It sounds great, is easy to set up and use. When it is set up, it should hopefully mean that IT don't have to babysit the meeting. This is the first time I have used a Polycom UCS based device with the new Skype for Business UI and I must say I am impressed. It now feels like a device that is designed for Skype for Business rather than a 3rd party device that happens to or can be made to work with Skype for Business like VVXs of old. The 5" touch screen is really responsive and the OS is nice and quick with no lag between taps and output. I have done a fair amount of testing and will say that when it works, it works well. My experience, however, has been hit and miss overall. I haven't found anything that would prevent me from recommending it, but there are flaws. Here's what I have found so far. I hope that Polycom will take notice and resolve the issues in future updates. If they do, I'll update this post and indicate the version required to resolve it. I am also willing to accept that some of this might be me, or my setup. Polycom or someone else out there might just tell me I'm doing something wrong and that it should work. At the time of writing, I am on UC Software release 5.4.4.7511. I'm using the Trio remotely, plugged into a PoE switch which is directly connected to my internet router. My internet is quite fast for the UK, at (typically) 75 Mbps down, 20 Mbps up. The back end is Skype for Business Server 2015 which is fully patched and Exchange Server 2013. My reverse proxy is a Kemp VLM, I have a public certificate from Digicert on my Edge and Reverse Proxy and I am running an Office Web Apps server which is proxied through the Kemp. Calendar - I had an issue yesterday getting in to the calendar and I got an error message. Today it is fine. Not sure what the issue was, but one to watch out for. Contact Sync - as I said above, the previous firmware gave me a choice of local contacts or corporate directory to search. Before I updated I think I was able to search for and find a contact in the Corporate directory. The new one doesn't present a choice. As of now, my Trio is unable to find any contacts when performing a search and I have many contacts in the directory. I don't know if this is because it is searching the wrong directory or just no longer has access to the corporate directory. No idea what it is doing - As I said above, when I clicked on update to update the firmware in the Web UI, I got a brief popup to say that it was doing something and that it would reboot when done. I got no such indication on the Trio itself. I got a spinning gear which seemed like it was doing something. Would be nice if I could tap the spinning gear and it would say something like "UC Software upgrade in progress. Phone will reboot without warning". Settings - there are probably thousands of settings that can be changed. But without going through each and every one it is hard to know what settings are a good idea and which aren't. Might be nice to have a template library with some nice typical settings based on Polycom's vast experience. Lync mode - Really? Skype for Business has been out for a good while now. I know they still need to cater for those that still haven't updated to SfB, but Polycom could list both. Really the only thing I can think of is Content Sharing. This really is a missed opportunity. Hopefully in future versions you'll be able to present additional content types shared in Skype for Business on the Smart Hub display. Would also be nice to attach a PowerPoint file to the meeting invite and have the ability to share directly from the Trio. If you use the People+Content IP application, you only get content and not video on the Smart Hub. Would be nice to have both, but that's probably where the RealPresence App comes in. At present, the Logitech C930e is the only supported webcam. It would be nice if the device supported customer supplied webcams, even if Polycom had a known good list. That said, the C930e is a really good HD webcam. The Trio 8800 is a really great conference/meeting room phone. It sounds great and most of all it is easy for anyone to use. The price is around £1,000 for the Trio phone only which makes it about £440 more than the CX3000. The fact that it is more than just a meeting room phone makes it pretty good value. You can also buy the Visual+ and Logitech camera separately, but it is better value to buy it as a bundle at around £1,500. The Visual+ and the Logitech C930e camera are nice add-ons which take the device from meeting room phone to meeting room system. The gallery video view on the Smart Hub display is nice and the fact that you can also present your screen into the meeting either using the Skype for Business client or one of the apps makes it a really compelling budget meeting room solution for new rooms or those that are updating old equipment. All in all, I would recommend the Trio. The conference phone is excellent, the Visual+ is a nice add-on. The fact that it only works with the Logitech C930e is a little annoying, but not a deal breaker. Polycom is missing a few tricks here and there, but not enough that should dissuade you. If you want to know more about this or any other Polycom devices and services visit Polycom.com. For detailed information on the Polycom Trio including resources and downloads click here.